The winter closure on many trails on the Crown will be extended this year because of snowy conditions and the needs of wildlife, the Bureau of Land Management announced Thursday. 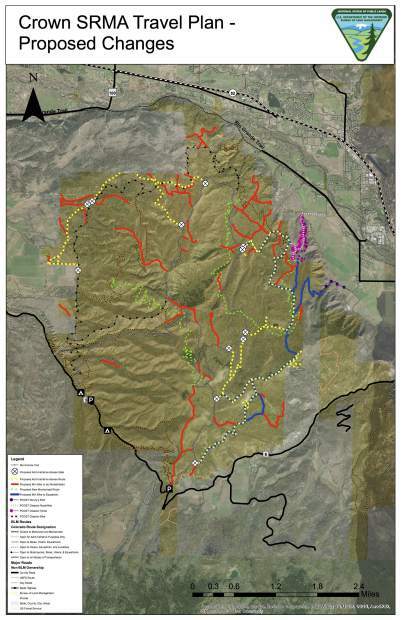 “Trails on the Crown that typically open April 15 will remain closed to biking and motorized uses until May 1,” the BLM announced in a statement released by Pitkin County Open Space and Trails. The organizations are land management partners. Access to the Crown from the Glassier Open Space will remain closed until its typical time on May 16. The BLM also announced that the closures will be extended on Light Hill and Williams Hill in the Roaring Fork Valley, at the request of Colorado Parks and Wildlife. Details on the BLM’s proposed adjustment to the Crown travel plan can be found at https://eplanning.blm.gov/epl-front-office/eplanning/planAndProjectSite.do?methodName=renderDefaultPlanOrProjectSite&projectId=119261&dctmId=0b0003e88131b777.